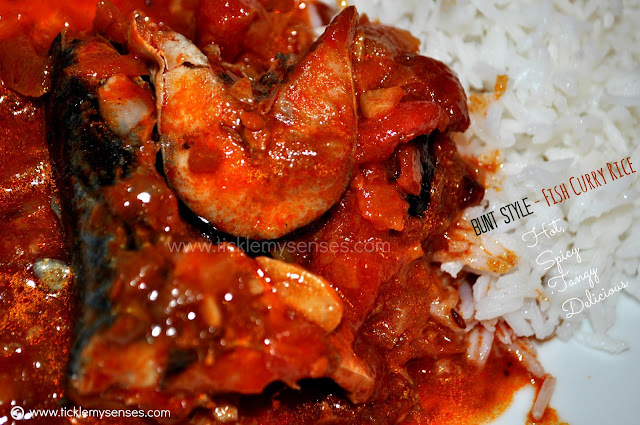 Tickle My Senses: Mangalore Bunt Style- Simple Fish Curry without Coconut. Mangalore falls under the rich and bountiful Konkan region of the South-West coast of India. This coast is lush with paddy fields, coconut-laden palms and sun kissed beaches. You will never tire of eating in Mangalore. Home to several communities ( to mention a few: the 'Mangalore Christians', 'Bunts' and 'Moplah community' ) it is endowed with a rich culinary heritage. Utilising the coconuts and red chillies grown locally, each community has its very own technique of combining spices and ingredients together to create dishes with very distinctive flavours. The Arabian sea, the rivers and ponds that traverse the land are teeming with varieties of delicious fish. 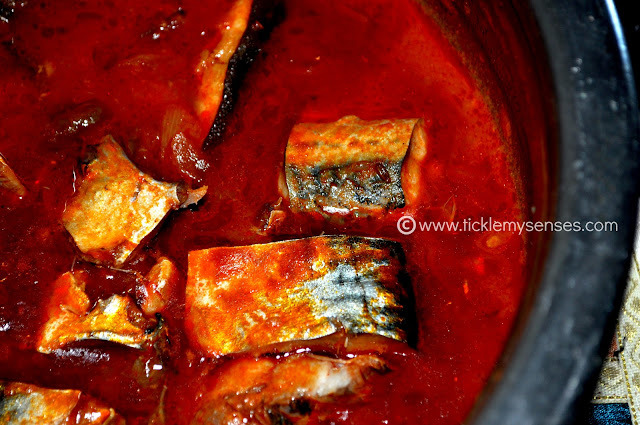 Be it Mackerals, Sardines, Pomfrets, Kingfish, Prawns, Clams or Crabs the Mangalorean house wife has perfected over generations the art of creating delicious curries, fry ups or dry dishes using ground spice pastes or powdered spice blends, all to suit the flavour and texture of the fish at hand . 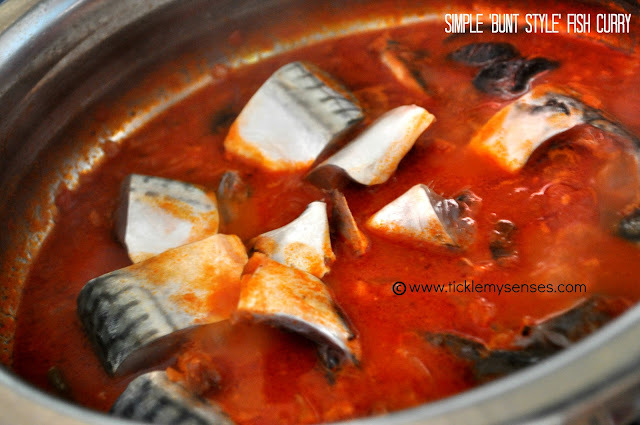 Todays fish curry is my version of Bunt's Special Fish Curry. The 'Bunts' known for their liberal use of local red chillies and coconut in combination with coriander, cumin, fenugreek, ajwain, pepper create the most delicious spicy, fragrant, flavourful curries. This fish curry is made using the 'Bunt Chilli powder' also known as the 'Bunt Thal da Podi' or 'Kundapur or Badakai Chilli Powder'. It is a roasted blended spice powder that uses a combination of various whole spices like cumin, coriander seeds, peppercorns, methi/ fenugreek seeds, turmeric and dried garlic. Every Bunt family has its own recipe to make this versatile spice blend. It is used to spice up chicken, red meat, fish, eggs, vegetables. One can create their own spice powder or buy it ready made from any Mangalore store in Mumbai or Bangalore. The homemade version however tends to be more fragnant and flavourful. Do try out this hot and flavourful curry and let me know your thoughts on it. 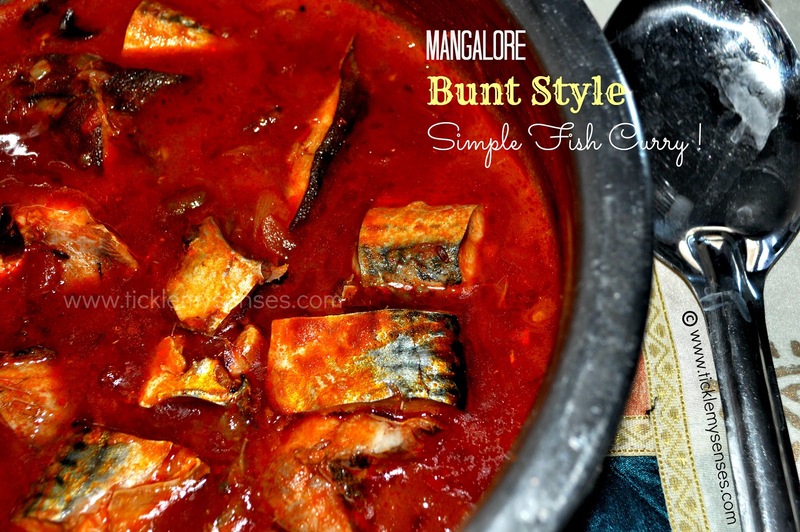 To Make Mangalore Bunt Style- Simple Fish Curry without Coconut. Serves: 4-5 | Preparation time: 30 minutes | Cooking time: 30 minutes. *Bunt chilli powder/ thal powder: 1 tbsp or according to your taste. See recipe below. Tomatoes: 2 small chopped finely. Tamarind extract/Vinegar: to taste or Kokum: 3 nos ( traditionally tamarind is used as souring agent in Bunt cooking) I use kokum or vinegar if I run out of tamarind. 1. In a large vessel heat 3 tsps of oil. When hot add the oma seeds and cumin seeds and curry leaves and green chillies and fry on a gentle flame till fragnant. Then add the finely chopped onions, ginger garlic add a pinch of salt and fry on a medium to high flame till onions turn lightly brown. 2. Add the Bunt /thal powder and fry quickly for 2-3 secs before adding the tomatoes. Add salt 1/2 tsp and fry till tomatoes turn soft ( 3-4 minutes). Then add a cup of water, adjust the salt add the tamarind extract/ vinegar or kokum to taste, close the lid and allow the curry to gently bowl for 4-5 minutes. Open the vessel taste salt/ sourness adjust. 3. Add the fish pieces flat in a single layer, turn the vessel in gentle round movements to swirl gravy over fish pieces, close lid and cook for a further 7-8 minutes on a medium high flame till fish is cooked. Turn off heat, serve hot with boiled rice or white rice. Can be used to prepare 1 kg of chicken or fish curry. 1. Clean & remove the stalks of the chillies. 2. Roast a handful of chillies on a heavy bottomed pan over medium flame. The chillies must turn brown & crispy when you break them with your finger. Remove & follow the same procedure until all the chillies are roasted. 3. Roast rest of the ingredients seperately over slow flame. 4. Cool. Place roasted spices in coffee grinder, add the dried garlic flakes and powder. 5. Sift using a metal sieve. 6. Stores in a airtight box, keep in fridge. Keeps upto one year. Note: The Bydagi chillies are also called Kaddi chillies are very mild in heat with a deep red colour. If substituting with any other chillies use your discretion and adjust quantity accordingly. 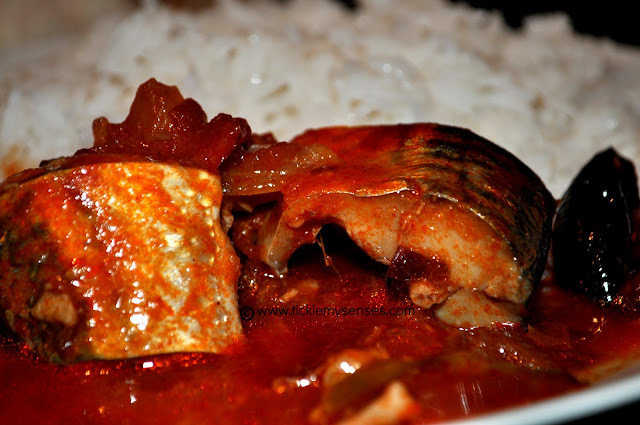 Looking for more Mangalore Fish Curry Recipes? Why not try these too! Italian Salvia Fritta or Sage fritters. Egg free and No-Churn Tender Coconut Ice cream.